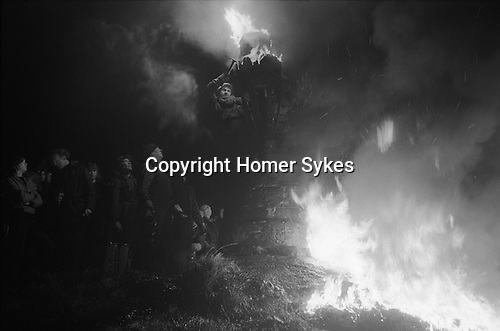 BRITISH FOLK CUSTOMS Burning the Clavie. Burghead Grampian. Scotland. Burning the Clavie. Burghead, Grampian. 1975. As the evening ends the Clavie is fixed to a stone column, one of the crew climbs up to smash the remains with a hatchet, sending pieces to the waiting crowd who scramble for the charred wood.